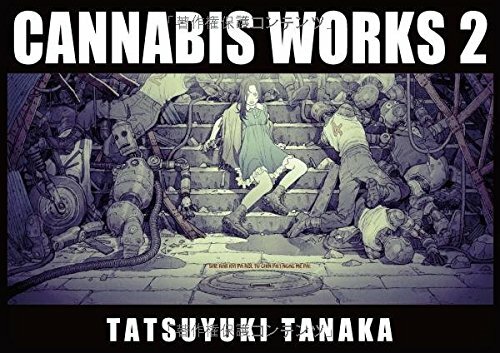 It's so great to see a new artbook from Tatsuyuki Tanaka. His first artbook came out in 2003 so this has been a long wait, but it's worth the wait. This 160-page hardcover is packed with wonderful drawings. The line art is so good. So detailed and representative of the top manga artists from Japan. Many have these sketch-like quality and selected pieces are given a limited colour palette treatment to evoke the lighting and mood that feels dystopia. Even for the first drawing in the book, the one right behind the cover, you're already being treated with lots of details. A mech has just tripped and the pilot fell out. In the foreground, a lady with fashionable sci-fi clothes and what seem like a walking rabbit are both holding pieces of paper as if looking for directions. There's so much details it invites you to admire the scene slowly. On the next page, there's an angel having a meal in a crowded restaurant after her shopping session with a fish-head body across the table. Most drawings in the book are snapshots of this strange world that Tatsuyuki Tanaka has imagined, and it's a pleasure to be able to visit these places and see these weird characters. There are also a handful of storyboards, comic panels and the last few pages features a silent story that runs one panel per page. Those who like manga style line art are going to love this book. Of course, I'll recommend getting the first book as well if you haven't done so.